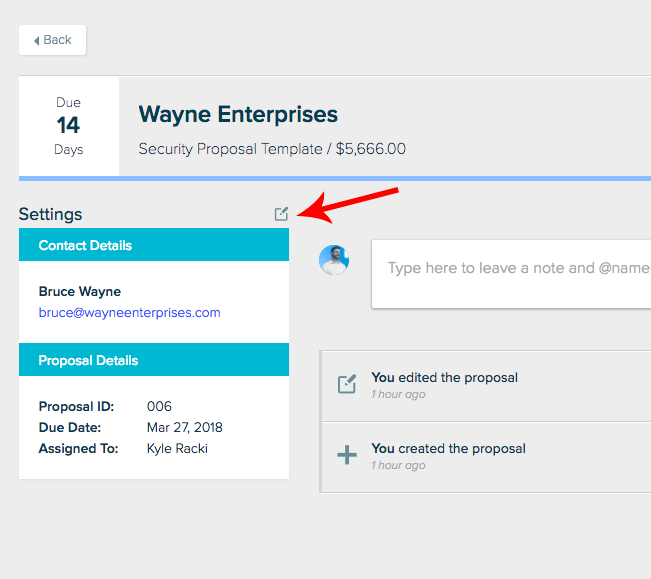 After you create a new proposal, or when you click on the proposal settings tab while in an existing proposal, you'll land on the proposal settings screen. Here you can update meta information associated with your proposal and adjust fee settings. The first section are your basic, required settings. There are only three pieces of information every proposal needs to have. What is the name of the project you’re trying to win? For example, website re-design or marketing retainer. This proposal name will appear anywhere in the proposal where the [proposal_name] variable is used. Who are you pitching to? The drop down contains a list of all your existing clients. You can add, edit and remove all of these clients by going to the client section. If you need to add a new client, you can do it directly within the drop down by clicking on “add new”. Then enter the details, like Company Name, the first name, last name and email address of your contact. The company name can now be used throughout your proposal by using the company name variable so it auto-replaces it with the correct value and makes find/replace much easier. To manage your proposal schedule, it’s important to know when your client is expecting to receive the proposal. Click on a date in the calendar. The due date is now available to use throughout your proposal by using the [due_date] variable. That’s all you need to get started. If you’d like to manage additional settings, click on the Show Additional Options link. There's other optional meta information you can add to your proposal, discussed below. You can choose which stream this proposal will go into. It will stay in your proposals by default. You can tag or categorize your proposal so it can more easily be found later on. If you need to keep track of your proposals with a number, enter it here. Otherwise it will auto-increment a unique number by itself. 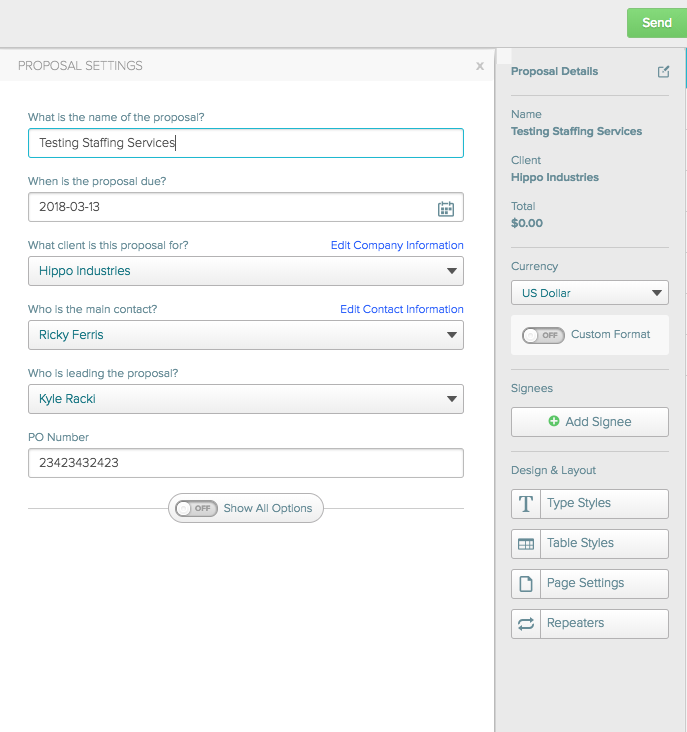 You can assign a user to the proposal to indicate that they are leading the proposal and are responsible for it. This will decide who gets the email notifications as well. There are times you need to upload supporting documents with a proposal. You can upload internal files that only your team members can see, such as the request for proposal (RFP). You can also upload files the client your pitching will see, such as a gantt chart. Once a file is uploaded you can choose whether or not it's visible to clients. 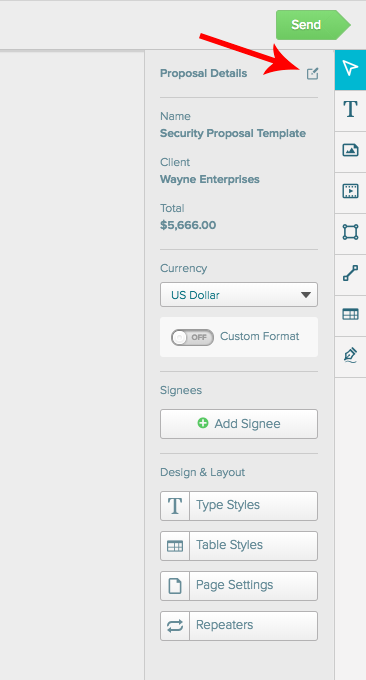 If turned ON clients will be able to view/download the file when they're viewing your proposal. 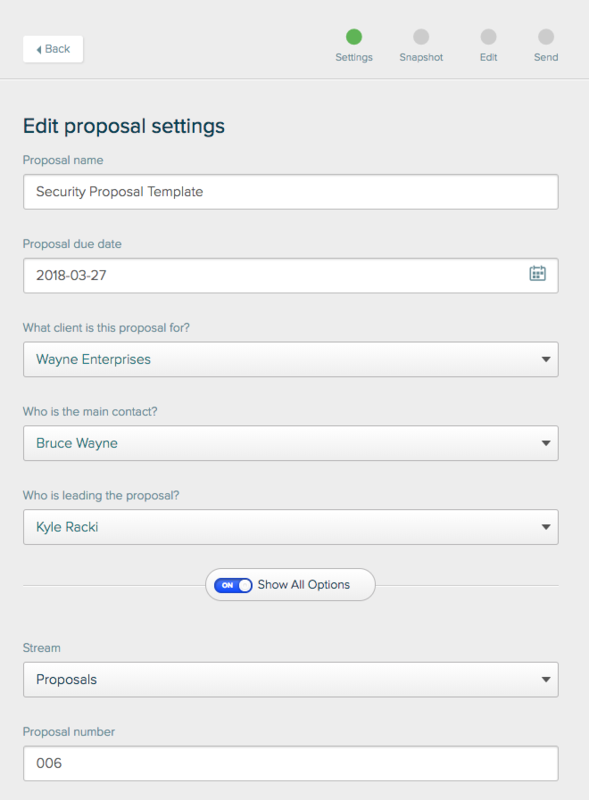 When you change proposal settings from within the editor it will open a form so you can make changes without leaving the page.